1. A shaped slab is rolled and cut out and coils are added and blended together to form the base. 2. Feet are pressed out from the inside and more coils and a tail are added. Piece is left overnight to firm a little. 3. Coils are added to form the shoulders, which are topped by a pinch pot shaped head. 4. Ears are shaped and fixed into position and a press molded little wren is placed on the top of the cat's head. 5. The piece is now ready to carve and all the fine details are added at this stage. Pot is left to dry out slowly for several weeks. 6. 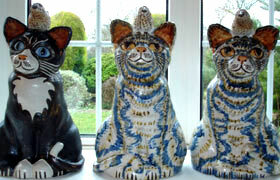 After a bisque firing up to 1000 degrees in an electric kiln, the cat is painted in stoneware glazes and stains. 7. The cat is finally fired to 1260 degrees. Each piece can take about 3 - 4 weeks to complete.